Harrah's Las Vegas Hotel and Casino is the center-Strip resort where the only thing you need to worry about is having fun. Come out and play! Stay at Harrah’s Hotel and Casino Las Vegas and you’ll be in the heart of the Las Vegas Strip. The hotel is also a stop on the Las Vegas Monorail system, which means you can easily visit the rest of the Strip and all of its attractions. Entertainment abounds at Harrah’s Hotel and Casino Las Vegas. Flair bartenders wow guests in the outdoor Carnaval Court bar. The Piano Bar delivers non-stop fun with dueling pianos and karaoke. Check out country star Toby Keith’s I Love This Bar & Grill for Southern food and live music. There are 6 shows on property including Tenors of Rock and magician, Mac King. 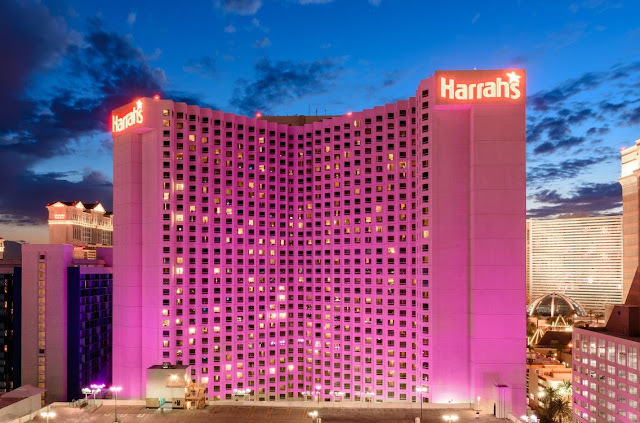 Harrah’s Hotel and Casino Las Vegas offers comfort and affordability with amenities including pillow-top mattresses, TVs with pay-per-view movies, hair dryers, and irons. Guestrooms in Harrah's Valley Tower have been completely renovated and offer flat-screen TVs, docking stations, rain showers, and bathroom vanities.